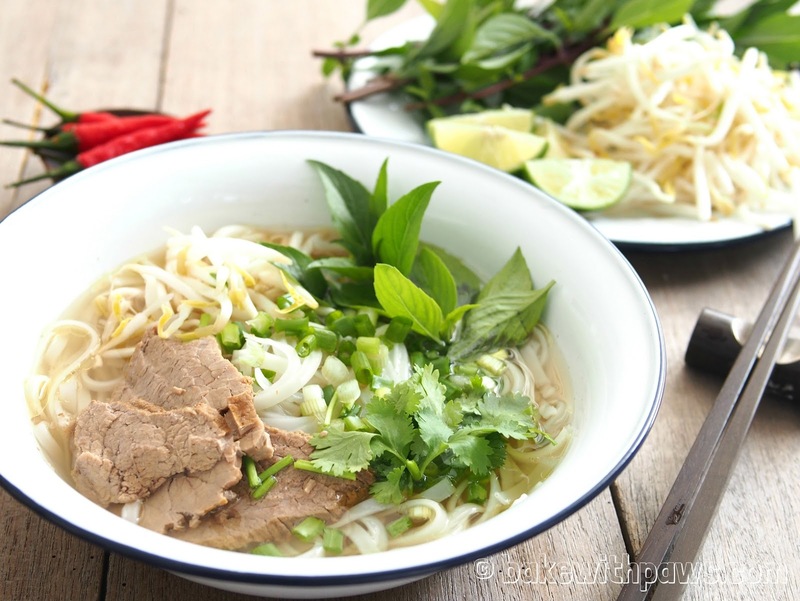 After our Hanoi trip, we were kinda missing the Pho. I decided to try my hand at cooking Pho Bo for my family. I researched a few recipes and settled on this as something that I thought would be authentic. 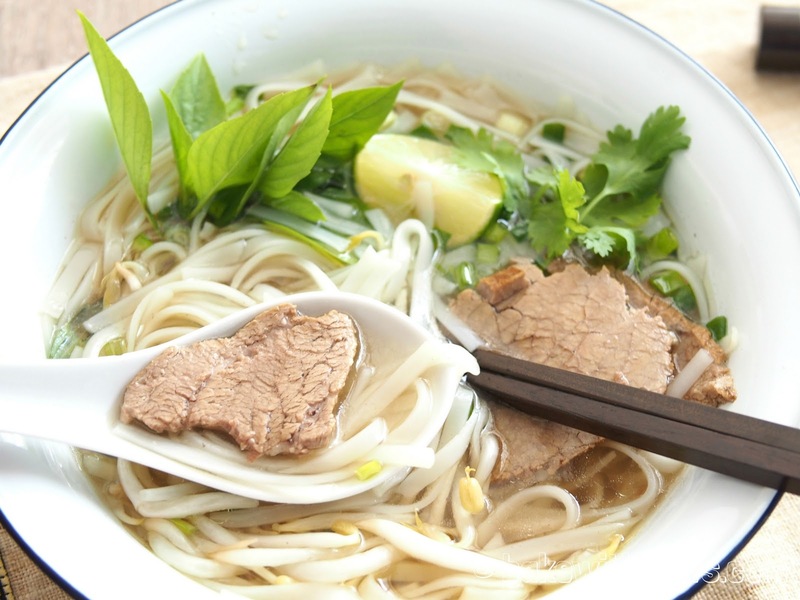 The result is a very satisfying bowl of Pho. My hubby said almost like what we had in Vietnam and that’s as good a compliment as I can hope for! 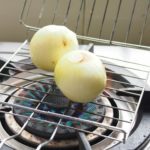 Char the ginger, onion and shallots over gas stove or electric burner on high heat. 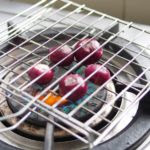 Remove when nicely charred on both sides. It does not need to be completely burnt. 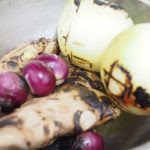 The charring imparts a subtle flavour into the soup. Next, blanch the meat and bones in a separate pot. Bring a big pot of water to boil. Throw in the meat and bones. 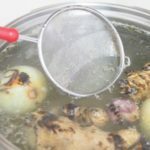 Let it boil for around 30 seconds then remove and rinse under running water. 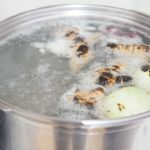 Discard the blanching water. 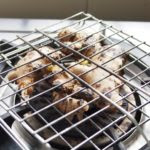 This is a necessary step to clean the meat and is essential to achieve a clear soup. 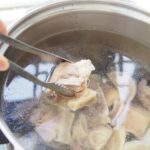 Then start the soup by placing the meat and bones in a big pot of cold water. This is another essential element of the method for a clear soup. Cook over medium heat. Add in the charred ginger, onion and shallots. Then turn to very low heat. 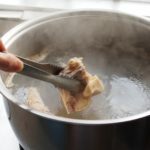 It is essential to monitor the broth and to never let it come to a boil. Keep it simmering slowly for at least 4 hours. It is fine to have a few occasional bubbles but never a rolling boil. 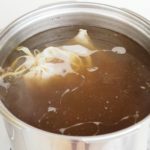 A rolling boil will cause the soup to turn cloudy. I simmered the broth for 7 hours. Frequently skim off the scum and impurities that rise on the surface and top up with water as necessary. Remove the beef brisket and set aside after 2 hour of cooking. 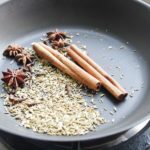 In the meanwhile, gently toast the dried spices in a saucepan by warming through until aromatic. Transfer the spices in a fine mesh bag and tie with string. Add the spice bag at the final 2 hours of simmering. Season to taste with salt, sugar, fish sauce and a dash of black pepper. Adding the spices bag any earlier would cause the flavours of the spices to dissipate. Adding it only at the last 2 hours would ensure a pleasant balance. After 6 to 7 hours, the broth is ready. Slice cooked beef into thin slices or chunks. Remove raw sirloin from the fridge and slice thinly. 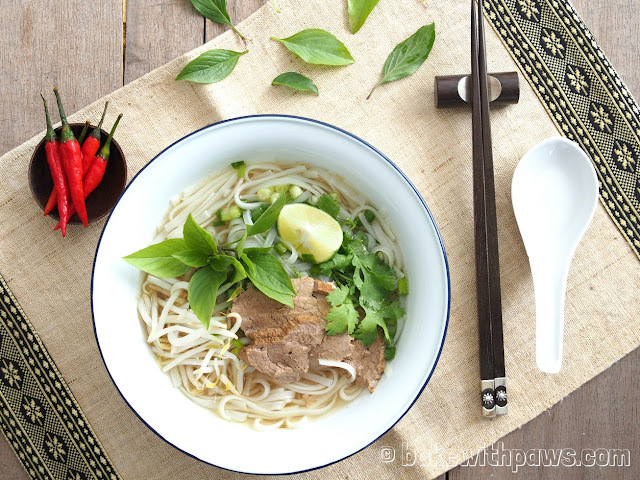 Place a portion of cooked noodle in a big bowl. Lay slices cooked brisket and thin slice of raw sirloin on top of the noodles. Pour the hot broth on top of the raw sirloin. Sprinkle with chopped coriander and spring onion. Serve immediate to top with fresh herbs, lime and sauce as you wish. In Vietnam, a hot siracha and a hoi-sin sauce is often served as dipping sauces for the slices of beef.